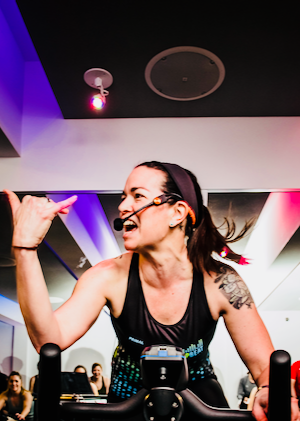 " From the spin bike to outdoor bootcamps and all that happens in between, fitness for me is about building a sense of self, building connections and building community. I teach because I love to be part of that and I'm inspired every day just by those who show up." "Just one small positive thought in the morning can change your whole day." My teaching style is a mix inspired by outdoor riding and high intensity interval drills. From world music, guilty pleasure pop songs to throwbacks that you forgot you loved, I use the dynamics of the rhythms and beats from all music genres that make you want to keep on pedaling. To me, nothing beats a table laden with great food, surrounded by people I can belly-laugh with. Add in a nice chianti and some chocolate for dessert and I'm in heaven!